An International Launch Services Proton rocket launches the AsiaSat 5 satellite from Baikonur Cosmodrome, Kazakhstan on Aug. 11, 2009. AProton rocket sent an Asian communications satellite on the way to orbitTuesday, successfully completing the first leg of a 9-hour mission to deliverthe four-ton craft to its new home in space. With six engines blazing afiery trail through the night sky, the 185-foot-tall rocket lifted off at 1947GMT (3:47 p.m. EDT) from the Baikonur Cosmodrome in Kazakhstan. AsiaSat 5, a new8,289-pound broadcasting and networking satellite for Asia, was bolted atop theRussian booster forthe launch. The spacecraft will be operated by Hong Kong-based AsiaSatellite Telecommunications Co. Ltd. The Proton broke the soundbarrier and soared intothe upper atmosphere within two minutes, before igniting its second stagemain engine and shedding its spent lower stage. 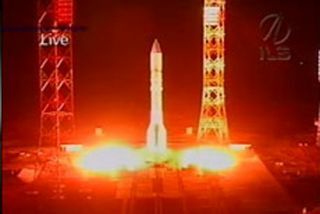 The launcher's third stagetook over five-and-a-half minutes after liftoff for a four-minute burn, duringwhich the Proton jettisoned the clamshell-like nose cone protecting the AsiaSat5 satellite. After emptying its fueltanks, the third stage released the rocket's Breeze M upper stage in aballistic trajectory just short of orbital velocity. The Breeze M, fueled bytoxic hydrazine propellant, ignited for the first of four burns about 11minutes into the flight and shut down at about the 18-minute mark. The first Breeze M firingput AsiaSat 5 into a low-altitude parking orbit, according to InternationalLaunch Services, the U.S.-based firm that oversees commercial Proton missions. The upper stage will ignitethree more times to raise AsiaSat 5's orbit and reduce its inclination. Spacecraft separation isscheduled for about 0502 GMT (1:02 a.m. EDT) Wednesday. AsiaSat 5 should bedeployed in an orbit with a high point of 22,236 miles, a low point of 11,154miles and an inclination of 6 degrees, according to ILS. AsiaSat 5's own engineswill be used to nudge the satellite higher over the next few weeks, eventuallysettling in a circular geosynchronous orbit 22,300 miles above the equator. Built by SpaceSystems/Loral in Palo Alto, Calif., AsiaSat 5's operational station will be at100.5 degrees east longitude. The satellite's orbital speed will match the rateof Earth's rotation, allowing the craft to hover directly above the island ofSumatra. The spacecraft carries 26C-band transponders able to reach more than 53 countries spanning from Russiato New Zealand and from Japan to parts of Africa, according to AsiaSat. AsiaSat 5's 14 Ku-bandtransponders will be attached to beams covering East Asia and South Asia. Athird Ku-band beam can be switched to satisfy market demands. Designed for a 15-yearlifetime, the satellite will replace the agingAsiaSat 2 platform launched in 1995.